On Christmas Eve we watched a movie called “The Nativity.” Watching it I was impressed with how earth-shattering the events of the incarnation must have been to Mary, Joseph, and their families. After an angel convinced Joseph of Mary’s purity and he took Mary as his wife, Jesus as his son, much rested on his shoulders. 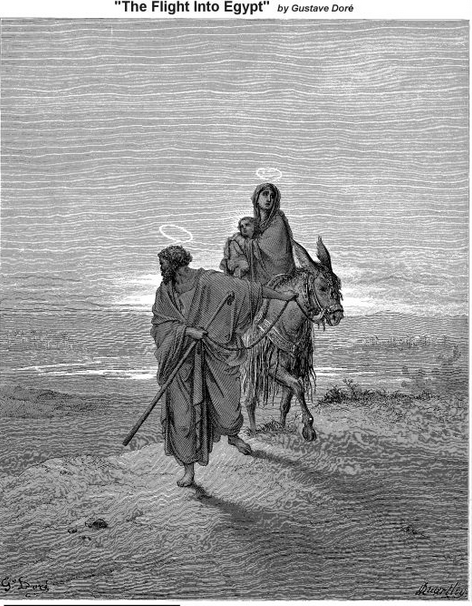 At least three times he had to break with routine so that Jesus would be safe—rush off in the middle of the night, move to a foreign country, move back home, but to which home (Matthew 2:13-14, 19-20, 22)? We who know the whole story probably don’t appreciate the weight on his shoulders. Was that dream I just had a word from God or the result of my over-active imagination? Is my uneasiness at returning to Judea justified or am I being paranoid? God directed Joseph, yes sometimes through voice and dream communication but also through his human emotions and intuition. It’s the same way I believe He directs us. Even when we’re not sure which path to take, He is there, as He has promised (“I will instruct you and teach you in the way you should go; / I will guide you with My eye” - Psalm 32:8). He leads, sometimes in ways as obvious as an angel visit or a voice (”Your ears shall hear a word behind you, saying,/ “This is the way, walk in it,”/ Whenever you turn to the right hand/ Or whenever you turn to the left” - Isaiah 30:21). At other times His leading is as subtle as that almost imperceptible check inside us we call “fear,” or “this is right,” or “just take the next step” (“I will bring the blind by a way they did not know; / I will lead them in paths they have not known. / I will make darkness light before them, / And crooked places straight. / These things I will do for them, / And not forsake them.” Isaiah 48:17). PRAYER: Dear Father, thank You for my mind, emotions and experience that work together with Your word and presence to give me guidance. Amen.